We cannot ship citrus to; American Samoa, Arizona, California, Florida, Guam, Hawaii, Lousiana, Northern Mariana Islands, Puerto Rico, Texas, Virgin Islands as per USDA Regulations. Make Key Lime pie. 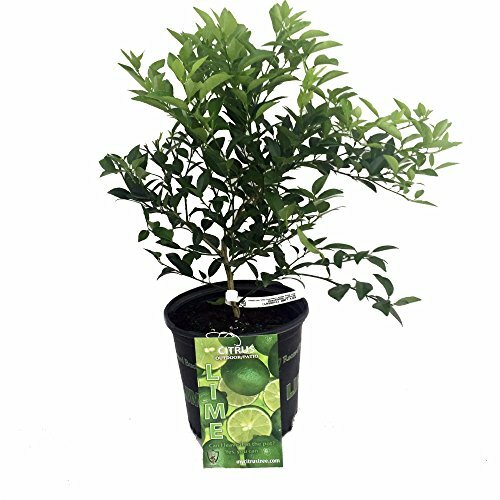 This glossy-leaved tree produces fragrant white flowers and small juicy green limes. Grows 6-8 feet tall, but can be kept smaller with pruning. If you live in Zones 4 to 8, plant these warm-weather species in containers so that you can move them indoors before freezing temps arrive. For all the bakers on your shopping list, this gift plant will award you with an abundant supply of wildly aromatic limes. Excellent for making key lime pies, but if baking isn't your thing, then use this "Bartender's Lime," also known as the "Mexican Lime," in your favorite cocktail. The fruit is daintier than store-bought limes and will be the talk of the party as you pick your own ingredients. Remember to grow in full sun for best results. Size shipped: Growing in 8" pot, about 18" tall. Fruiting size. We cannot ship citrus to; American Samoa, Arizona, California, Florida, Guam, Hawaii, Lousiana, Northern Mariana Islands, Puerto Rico, Texas, Virgin Islands as per USDA Regulations. Make Key Lime Pie. Easy to grow. Can remain outside with temperatures above 40 degrees F.